Where to start. 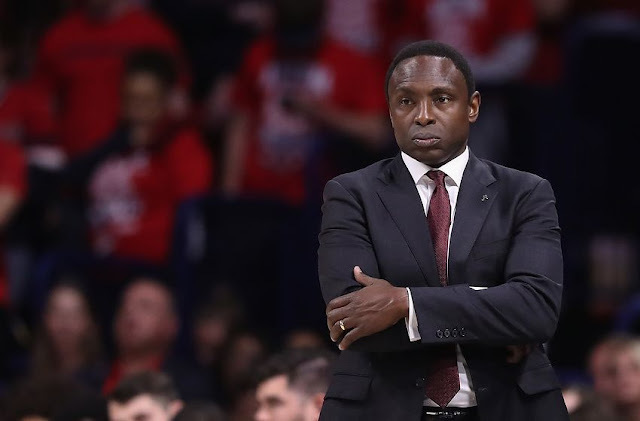 Losers of six of their last ten games, the Alabama men's basketball team will look to put their season back on track when they host the South Carolina Gamecocks on Tuesday. The Tide is coming off a humbling 65-46 beatdown to the Georgia Bulldogs this past Saturday, a game that wasn't as close as that final score. Game time for Tuesday is 6 P.M. CT. The game will be televised on the SEC Network. Click the links (if you dare) for team and KenPom stats. My Two Cents: Things are bad for the program at the moment. Six losses in their last ten games. A 1-2 start in conference play. The possibility of no postseason play becoming more of a reality. A team beset by injuries. A team trying to play through its youth and the mistakes that accompany young basketball players at this level. Inconsistent (at best) coaching. A team with no obvious floor leadership. A program that has struggled to create a culture of winning and the confidence needed to sustain that culture once it's established. And a fanbase that has witnessed so much mediocrity in this program over the last decade that many of us throw our hands up in frustration at the first sign of adversity. There are so many positive things that have happened off the floor in the last two seasons, specifically recruiting and raising the profile and interest in the program. But the continued struggles on the floor have tempered most, if not all, of the enthusiasm that surrounded the program entering this season. With sixteen games left on the schedule, plus the SEC Tournament, it's too early to toss this season into the trash heap. But if this team is going to salvage this season, it has to start in practice and the games right now. Alabama will play five of its next seven games at Coleman Coliseum. How this team performs in those games will determine this season. Not overall, because, short of an earth-shattering run through the remainder of the schedule, I don't think this team will be able to match the expectations many Alabama fans had coming into this season. But with a schedule full of resume opportunities left, if this team can grow and improve, they may be able to play their way back into postseason contention. There will be some fans that will not be satisfied with merely making the NCAA tournament in a season in which many predicted this team to be top 25 good, perhaps good enough to win an SEC title. But there should be little argument among fans that it's important for the program to find a way to end its six year NCAA Tournament drought, no matter what circuitous route is taken to achieve that goal. Things are not good right now, but they won't get better if we abandon this team. I encourage all of you that can make it to the game on Tuesday night to set aside your frustrations as a fan and go cheer this team on to victory. It's not about preseason expectations at this point; it's about getting a win, and generating some kind of confidence to help this group of players off the mat. We can be vocal as fans about frustrations with the coaching staff or this player doesn't need to play this many minutes, but we can also remain steadfast in cheering on this team to repair its problems and start playing winning basketball. I feel confident in saying that every one of these players wants to win. By all accounts, this is a group of good guys. And I always want to pull for the good guys to win. Players to Watch: You don't miss your water until your well runs dry. Or something like that. Dazon Ingram missed Saturday's game with the flu. His status for Tuesday is unclear. At the moment he's likely a game-time decision. His presence on Saturday probably doesn't change the final score, but Dazon has quietly had a good sophomore season in terms of production. He's averaging 11.1 ppg, 6.5 rpg (2nd on the team), and 3.0 apg (2nd on the team). An unfortunate stat that he leads the team in is turnovers (2.4), but guys that have the ball a lot (Collin is right behind him with 2.3 per game) are going to have elevated numbers in that category. Nevertheless, Dazon does a little bit of everything for this team. I'd like him to take on more of a leadership role if he's capable of that kind of personality. But more importantly, I'd like to have him back on the floor Tuesday night. Chris Silva is the best player for this Gamecock team, and the kind of physical low post scorer/rim protector that has given Alabama fits in recent weeks. Silva is also a foul machine at times. In Carolina's five losses this season, Silva is averaging four personal fouls per game. In their ten wins, he's averaging 2.9 fouls per game. I'd be willing to bet that Silva's minutes on Tuesday night will have a direct impact on the final score of the game.